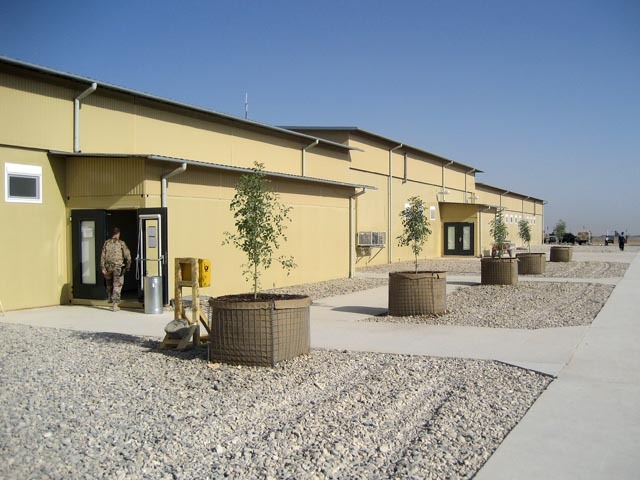 For the military camp of the German Armed Forces in Mazar-e Sharif, Afghanistan, SÄBU erected a field camp kitchen in transport-optimised modular construction. The camp kitchen offers a 90% basic protection against splinters of 107 mm T63 HE missiles or similar projectiles. The scope of services included the planning, production, transport, assembly and implementation of the camp kitchen. As complete facility for a rating of 2100 persons the camp kitchen has been designed in the way that the operation of a kitchen including canteen can effectively be organised. The camp kitchen serves for the full board of all national and international forces that are stationed in the military camp in Mazar-e Sharif. The building has a surface of approx. 3900 m² with ceiling heights of up to 4.50 m.
The camp kitchen fulfils the safety, hygienic and ergonomic requirements of canteen kitchens.